After more than a month of delays, SpaceX might finally be ready to launch a secretive spacecraft, Zuma. If all goes as planned, a SpaceX rocket will lift off from the Cape Canaveral Air Force Station in Florida on Sunday. A two-hour launch window begins at 8 p.m. ET. The space exploration firm, which is headed by Tesla (TSLA) CEO Elon Musk, initially scheduled the secretive Zuma mission for last November, but a series of delays pushed it back. SpaceX gave some reasons for the schedule changes. At one point, SpaceX said it was delaying the mission for "fairing testing." The fairing is the very top portion of the rocket that houses the payload. "Extreme weather" also slowed down the company's launch preparations. Last week, SpaceX finally declared that both the rocket and the payload were "healthy" and ready for launch. Team at the Cape completed additional propellant loading tests today. Extreme weather slowed operations but Falcon 9 and the Zuma spacecraft are healthy and go for launch—now targeting January 7 from Pad 40 in Florida. Zuma is headed for low-Earth orbit, but we don't know exactly where. SpaceX will likely cut off its customary live stream of the launch early in order to avoid dropping any hints about the spacecraft's final destination. It has done so during other secretive missions. Zuma was built for the U.S. government, and it's not unusual for the government to keep information about sensitive payloads under wraps. Typically these payloads involve a military concern, such as national security, defense or surveillance. When asked about the project in November, Northrop Grumman (NOC) -- the Virginia-based aerospace and defense company that says it's "involved" in the Zuma mission -- declined to give any details about the spacecraft or reveal which arm of the government funded it. "The U.S. Government assigned Northrop Grumman the responsibility of acquiring launch services for this mission," the company said in a statement. "Northrop Grumman realizes this is a monumental responsibility and we have taken great care to ensure the most affordable and lowest risk scenario for Zuma." ArsTechnica reported in November that Zuma actually belongs to the National Reconnaissance Office, a U.S. government agency that develops and maintains spy satellites. The report acknowledges, however, that the NRO has publicly denied that the Zuma payload belongs to the agency. SpaceX has conducted one secretive launch for the NRO before. 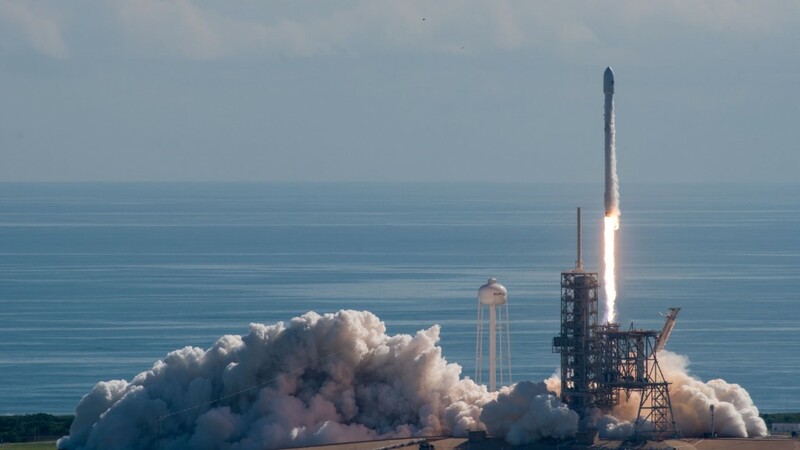 Last May, SpaceX put an NRO spy satellite into orbit. But in that case, the agency did not shy away from claiming involvement. SpaceX also launched a covert space plane in September for the U.S. Air Force. Even if SpaceX doesn't live stream the entire flight Sunday, it's worth sticking around after liftoff. That's because SpaceX will attempt to execute its signature move: guiding the first-stage rocket booster back to Earth for a safe landing. SpaceX lands boosters so they can be reused in future missions. It's meant to help make spaceflight cheaper. Sunday's launch will mark the first mission of 2018 for SpaceX. Last year was already a banner one for the company. It completed 18 missions in 2017, more than any other private-sector launch provider. By comparison, the company launched just eight times in 2016. SpaceX has plans for an even more impressive year ahead. SpaceX President Gwynne Shotwell told SpaceNews in November that the firm plans "increase our cadence next year about 50%" in 2018. The company also plans to debut a massive new rocket called Falcon Heavy. It's supposed to be the most powerful operational rocket in the world, according to specs released by SpaceX. The first Falcon Heavy test launch is slated for sometime this month.